Come watch some great basketball and help raise money for a great cause on Saturday, February 3 at MLHS! Our basketball teams will compete in a boys-girls doubleheader versus Cleveland. Game times are 1 PM for B Girls, 3 PM for B Boys, 5 PM for Varsity Girls, and 7 PM for Varsity Boys. The Cleveland boys are currently ranked seventh in the state, while our Mayer Lutheran boys are ranked fifth. It should be a great game to cap off a great night and great event – Crusaders for a Cure. 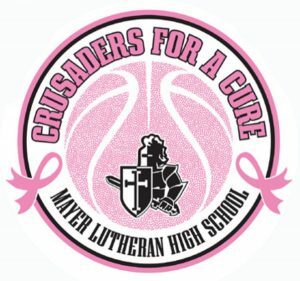 This will be the eighth year for our Crusaders for a Cure event. All of the proceeds from the event stay local and go to the Pay It Forward Fund at Ridgeview Medical Center. This fund helps women who are undergoing cancer treatments pay their bills. In our first seven years we have raised over $32,000! There will be a bake sale, with all individual items on sale for $1.00. We will also have pulled pork sandwiches available all day. There will be t-shirts for sale beginning Friday morning, and of course we will take donations all day long. Donations can be given to any boys or girls basketball player. A donation form has been attached if you would like to honor someone in your life who has battled cancer. We will also be holding three shooting contests on Saturday. These will be held at halftimes of the games and in between games. All prize drawings will be held following the final game of the evening. Information on these is attached and below. The first contest is the one we have always held. You can pay to take a shot from a location on the court; if you make the shot you get a ticket into the prize drawing. This contest is for the majority of our prizes, including the grand prize of a 40″ smart television. Here are the locations and costs of these shots. The second contest is rent a player. The cost of this contest is $10.00. The player you rent will shoot two free throws. If they make both free throws, you will get a two tickets into a drawing for a 40″smart television. If they do not make both free throws, you still get one ticket into the drawing. NOTE: this drawing is only for a 40″smart television. The third contest in a new one. This is the Game System Contest. For $20, you will be given an entry into a drawing for an Xbox One and a Nintendo Switch. You will be able to shoot two free throws. For each free throw you make, you will receive an extra ticket into this drawing. This event is a great testament to the Holy Spirit’s work in our community. For a school our size to raise this kind of money is truly remarkable, so thank you for all of your efforts in making this event a success. We could not do it without all of you!